Most long-standing relationships go through ebbs and flows. Sometimes I feel like I should be farther along in my yoga practice, having taken my first class over a decade ago. But it’s really in the past few years that my discipline, appreciation, and strength in the practice have deepened. As with other relationships, the firsts are so delicious. 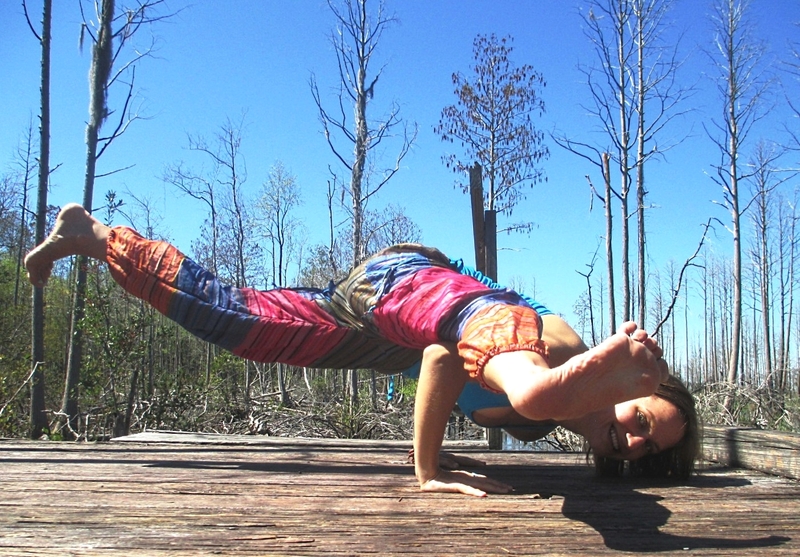 Landing a jump-back from crow to chaturanga rather than collapsing in a belly flop, balancing in bound half moon (ardha chandrasana), transitioning from tripod headstand to crow and back again (picking my head back up off the floor is the hardest). Things I used to not be able to do, and now I can. There’s such a thrill in the first time you realize your body is capable of THIS. I’m still not even close to handstanding in the middle of the room – inversions have posed a worthy challenge in conquering fears, both on and off the mat. My hips are open, but my hamstrings are tight – everyone’s body is geared toward different strengths. Some advanced practitioners may appear uniformly gifted in the practice, but I haven’t witnessed the amount of work it’s taken to get them to the point they’re at. I’ve only witnessed my own path, which continues stretched out before me offering new challenges. For me, overall, the process of building dual flexibility and strength has been so empowering. I am someone who’s needed some empowerment. I grew up rather shy and quiet, an observant writer type, friendly but introspective, without enough dirt under my fingernails or skinned knees (I’d like to encourage plenty more outdoor rambunctiousness as a parent than I had as a child), and without great natural athletic ability – though I tried to make up for that with hustle. My first grade-school trophies were for spelling and writing, plus the “most improved” award for eighth-grade basketball. Yoga has provided me with increased strength, presence and confidence, for which I am immensely grateful. I have an active ‘mental hamster wheel,’ always trying to remain a step ahead of my full schedule. But the ability to walk into a yoga class after a long workday and SETTLE INTO ME for 90 minutes out of 16-18 waking hours feels like a breath of fresh air. Or a comfy seat, or perfect view, or optimal amount of sunshine on my skin. The chance to tune everything else out and just focus on my breath, and a moving meditation (which comes easier to me than seated meditation). To try to step back and actually watch my monkey mind, while flowing through directed movement, supported by a class striving for the same. To operate in-to-out, rather than reacting out to in. It’s hard to let go, and it doesn’t always happen right away. I try to remember that I’m not going to solve anything external in the next 90 minutes, and my preoccupations will be there waiting for me once class is over. And usually at some point, hopefully sooner versus later – my body heats up and I finally turn inward, feeling my movement become more mindful, taking pride in my body and what it can do. Creating more space in my body and space between my thoughts. Without fail, I leave feeling more open, more present, more peaceful than when I walked in. Such a priceless gift. And for these continual and cumulative results, I am ever grateful.